David Kirchhoff is the president and CEO of the biggest weight-loss program in the world: Weight Watchers. However, in Weight Loss Boss, he speaks from the perspective of a regular person who has struggled with his weight. He shares his professional and personal story and the valuable lessons he learned along the way. He aims to help readers by offering tips on how to lose weight slowly and steadily and keep it off. Kirchhoff is the CEO of Weight Watchers – but he is also a member – and one of its biggest success stories. He asserts that the only way to achieve long-term weight control is to permanently adopt a healthy lifestyle. Integrating new beneficial habits and stringently controlling your food environment help you to make this transformation. A few of the strategies offered in the book are as follows. Kirchoff asserts that willpower is overrated and eventually you will give into temptation, especially if unhealthy foods are in your environment. The key instead is to eliminate your trigger foods and replace them with healthy alternatives. When you plan your meals in advance and prepare for potentially challenging situations you will be much more successful. Letting people know about your goals and intentions can create accountability and help you access support from your community. You may also find a weight loss buddy, like a friend or spouse, to keep you motivated. If you can’t find anyone in your area you may consider joining an online forum or creating a weight loss blog. If you want to change a habit you need to find the motivation to let it go. Kirchkoff recommends using rewards (other than food) to give you the necessary incentive. For example, you can schedule your exercise sessions so that you watch your favorite television shows as you use the exercise bike or treadmill. If you build routines around your new healthy behaviors, within 4-6 weeks these habits will become automatic. David Kirchhoff lost 40 pounds and kept it off for 3 years! Fruit, vegetables, beans, peas, whole grains, oatmeal, fat-free Greek yogurt, seafood, lean meat, poultry, eggs, soy products, nuts, seeds, salsa, popcorn, fat-free salad dressing. Readers are advised to plan ahead for exercise, make it a priority, and schedule it into daily routines. You are encouraged to try new forms of physical activity until you find something you enjoy. The book includes a bodybuilding “split routine” where you exercise different muscle groups on different days of the week. 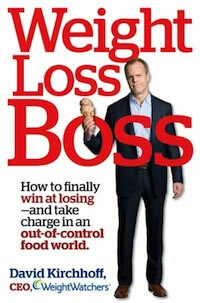 Weight Loss Boss: How to Finally Win at Losing–and Take Charge in an Out-of-Control Food World retails at $25.99. Provides information about the Weight Watchers program and how it works. Focuses on the formation of good habits that will support a healthy lifestyle approach to weight management. Offers a variety of practical strategies for reducing calorie intake. All author royalties will be donated to Share Our Strength, a nonprofit organization that supports the goal of ending childhood hunger in the U.S. Some dieters will require more structure to successfully lose weight. May take some time to see results until new diet and fitness habits are solidified. Can David Kirchhoff Inspire You? This book highlights the personal weight loss journey of the CEO of Weight Watchers as well as the successes of others. It offers practical advice to help you easily reduce your calorie intake as you make permanent changes towards a healthier lifestyle.